A new recruit is about to step onto the yellow footprints — only he needs four of them, and they need to be paw-shaped. Rct. 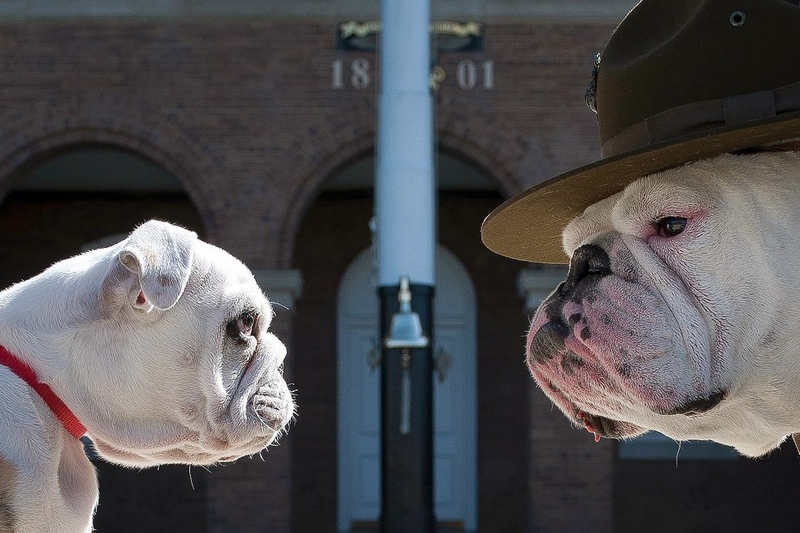 Chesty XIV, the new Marine Corps mascot, met his drill instructor, Sgt. Chesty XIII, for the first time this month. And judging by the look on the sergeant’s face, it seems he’s prepared to use some serious knife-paws on the pup. Rct. Chesty will fill a long line of English Bulldogs who represent the Marine Corps. He’ll likely meet important players like the commander in chief and the defense secretary, which is why he’ll need his predecessor’s help in making that transition from civilian puppy to Marine Corps devil dog. Capt. Jack Norton, public affairs officer at Marine Corps Barracks Washington, D.C., recently sat down with Fox News’ Chris Wallace to discuss Rct. Chesty’s important career. Hopefully he won’t repeat some of the mistakes his DI made when he was a young pup, which resulted in some nonjudicial punishment. But it’s a message, Norton added, because the Corps can’t have a mascot running around biting, barking and doing things that they’re not supposed to do — especially in front of his superiors.